Fred Leavitt was commissioned by the Chicago Council on Fine Arts to produce the city's first permanent photographic exhibit in a municipal building. The year long commission resulted in a body of work that documented the Pullman district of Chicago. Pullman, a Historic Landmark in Illinois, is the town that railroad magnate George Pullman built to house the factory workers that produced the Pullman coaches. This award winning (see Background) book is a spin-off of the 50 print exhibit permanently mounted in a Chicago court building. The nine inch square, eighty page, duotone hard cover book is printed with a two hundred line screen on archival paper. 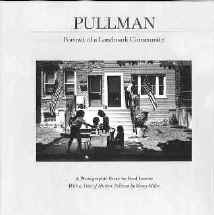 It is published by the Historic Pullman Foundation and printed by R.R. Donnelly & Sons. When Mr. Leavitt returned to the city of Chicago after having spent a year documenting the wetlands of Florida (see Wetlands) he saw the city as a part of nature, as an ant hill or bee hive would be. He spent the next two years producing a remarkable photographic essay that shows urban living with a sense of wonder and a special wit (see Chicago Prints). 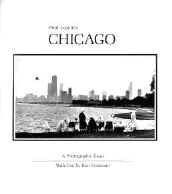 Fred Leavitt's Chicago is an award winning (see Background) landmark publication printed in a proprietary continuous-tone process that eliminates the half-tone printing screen. The remarkable tri-tone reproductions almost appear three dimensional in shifting light. The 128 page hard and soft cover book is ten inches square and contains 87 reproductions. It is printed by Black Box Collotype and published by Jannus Art Publishing in Chicago. Lies (People Believe) About Animals won three prestigious national awards: 'Science Teachers of America Award for Outstanding Books', 'Best Children s Books of 2014' and 'Amazon's Editors Favorite Books of the Year'. 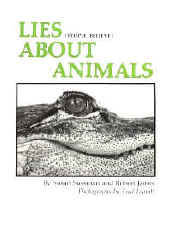 Lies (People Believe) About Animals is a book that explores and explodes myths about animals. If you believe that you can get rabies from a squirrel bite, or that a porcupine can shoot it's quills you will learn a lot from this book.
. The animals were photographed in black and white on a white seamless background. The images give us a fresh look at the unique designs in the animal world. The book is hard cover, 8.5 x 11 inches with 48 pages. It is published by Albert Whitman & Company, Niles, Illinois.